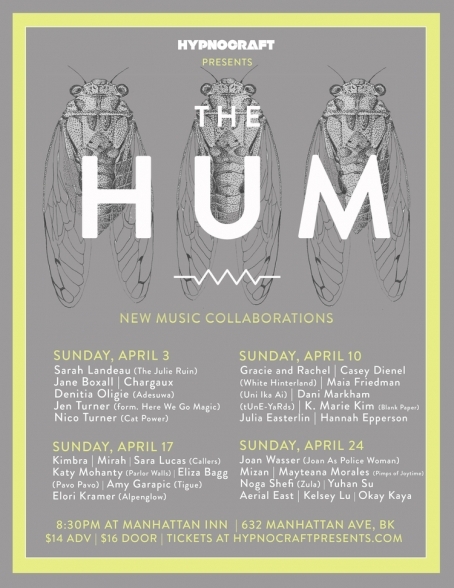 The ladies over at Hypnocraft certainly got us hypnotized with this weekends lineup for the upcoming appointment of The Hum (the weekly, female-artists-only, collab night that The Deli sponsors) and it’s definitely not the first time., since it's showcasing mostly local artists we ourselves love and have covered in this very blog. At this week’s show on Sunday (4.10) the first pair kicking off the night is Casey Dienel (White Hinterland) alongside the lovely and talented ladies of Gracie & Rachel. With beautiful vocals and a keen ear for strong melodies we can almost hear the entrancing, orchestral performance from these gals already. Followed by Julia Easterlin and Hannah Epperson we can already hear a track built up solely by vocal loops and smooth violin chords, something sweet to get us dreaming. For the final performance we can expect to be enticed by solid drum progressions and synth ambiance courtesy of Dani Markham (Tune-Yards), Maia Friedman (UNI IKA AI) & K. Marie Kim (BLANK PAPER). So stroll on over to Manhattan Inn this Sunday, April 10, for some some great performances in a cozy and intimate environment!